NUKU’ALOFA, Tonga, 17 February 2009 – The International Telecommunication Union (ITU) and the One Laptop per Child Foundation Inc. (OLPC) today announced a new ICT development partnership to benefit the school age children in the poorest countries of the Asia Pacific. On the occasion of the Pacific ICT Ministerial Forum: Connecting the Unconnected held from 17-20 February 2009 in Nuku’alofa, Kingdom of Tonga, Mr Sami Al-Basheer, Director of the ITU’s Telecommunication Development Bureau and Mr Michael Hutak, OLPC Regional Director, Oceania, announced a new joint effort to bring laptops to school children in least developed countries in the Asia-Pacific region, in particular the Pacific Island countries. This new collaboration will contribute to ITU’s new global flagship initiative, Connecting Children. As part of Connecting Children, ITU is reaching out to partners active in the low cost laptop field to launch innovative public-private partnerships to serve the needs of school children in least developed countries, recognizing that traditional market models are not adequate to reach these children. Through Connecting Children, ITU aims to build upon existing efforts in technical development, manufacturing, distribution and marketing as well as teacher, student and institutional training, and join forces with various partners under a common banner. ITU plans to announce additional partnerships with other industry players in the coming weeks and months. 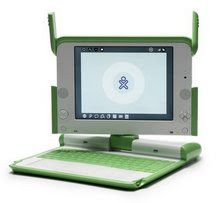 OLPC is a global non-for-profit association, committed to the research and development of technologies to revolutionize the education of children. OLPC’s goal is to provide elementary and secondary school-age children around the world with connected laptop computers and enabling software to empower them to learn, explore, experiment and express themselves in new, creative and productive ways. OLPC is further dedicated to bringing this technology first to the world’s Least Developed Nations. As part of a shared ITU-OLPC effort in Asia-Pacific, ITU will identify potential partner countries and coordinate with Governments and relevant agencies to identify requirements and will handle administrative requirements, including facilitating shipping of equipment. OLPC will supply laptops to participating countries, with the support of donors, and will work with all partners to realize sustainable programs through cohesive deployment in schools, sufficient capacity-building and effective technical support.